Clara, Barry, Naomi, and Claudia. In 1925, in the northern town of Hagen, Germany, Arthur and Claire Meyer welcomed their son, Ulrich, into the world. It was a chaotic time: World War I had devastated Europe and caused hyperinflation and mass unemployment in Germany. Many Germans saw their life’s savings disappear and were thrown into poverty. In the Meyer house, there was personal tragedy—Claire suffered complications from childbirth and died two weeks later, leaving newborn Ulrich and his older sister, Gerda, without a mother. Arthur Meyer eventually remarried, hoping to bring stability to the family. But economic chaos made Germany’s new democracy very fragile, and stability became impossible. In 1934, when Ulrich was nine years old, Hitler abolished the office of President and declared himself “Führer” of Germany. In 1935, just before Ulrich’s 10th birthday, Germany adopted the Nuremberg Race Laws. German Jews were denied citizenship, prohibited from marrying anyone of “pure” German blood, and disenfranchised. In an attempt to protect his children, Arthur Meyer sent Gerda and Ulrich out of Germany. Between 1938 and 1940, so many Jewish parents sent their unaccompanied children abroad to escape Nazi persecution that the phenomenon was given a name—“Kindertransport.” Gerda went to England, where she became a servant to distant relatives. Ulrich was smuggled across the nearby border to Holland, where he was put in an orphanage. On the night of November 9, 1938, Nazis across Germany looted synagogues and broke into Jewish businesses. It would be called “Kristallnacht,” The Night of the Broken Glass. In Hagen, where the Meyers lived, the town’s only synagogue was set on fire, its books and furniture burned. Jewish homes and businesses in Hagen were looted, their windows broken. At some point before 1940, Arthur Meyer traveled to Holland to retrieve his son. 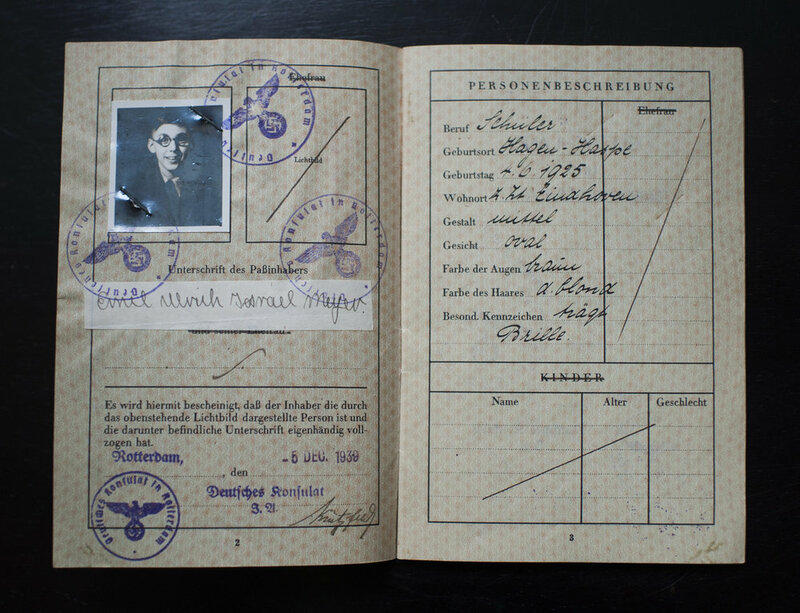 On December 5th, 1939—almost one year to the day after Kristallnacht—fourteen-year-old Ulrich Meyer got a German passport and an immigration visa to the United States. The Meyers found a way to retrieve Gerda, and the family boarded the third-class decks of a Holland America ship bound for New York City. They arrived on December 22, 1939. The Meyers settled in Chicago, where Ulrich and Gerda attended Senn High School and became US citizens. As a teenager during the war, Ulrich served in the US Navy in Okinawa. After his honorable discharge, Ulrich made use of the GI Bill and attended junior college, then went to work as a salesman at Goldblatt Brothers Department Store. Later, Ulrich started his own business—a carpet store that turned into a successful chain called Carpetland USA. In his fifties, he married Harriet and had two daughters: Claudia and Nicola. They settled in Hyde Park, where Ulrich continued to work. Nicola became a pediatrician and Claudia the director of the Early Childhood Center at JRC. On September 16th, 2016, Ulrich passed away at the age of 91. Below is his family story, as told by his daughter, Claudia. Ulrich as a boy in Hagen, Germany. Naomi and Clara hold a picture of Ulrich and Gerda. …America was in the war…and they sent him [Ulrich] to Japan, because they didn’t want him to be in Germany and people would think he was a traitor. So he was a Seabee [ part of the United States Naval Construction Battalions] He…did the construction in Okinawa. Claudia and her sister, Nicola, with her mother Harriet and her father Ulrich. Because of the history and everything that happened, he [Ulrich] was not raised religious. They weren’t eager to share their religion based on what had happened in Germany…a lot of Jews at that time didn’t suppress their religion, but they didn’t say: ‘We’re going to…be super-religious,’ because they were really deep-down nervous what would happen. And so, for us, growing up it was much more cultural… his story and his history and the importance of who the Jewish people are, and who they were, and what happened to them. So we really grew up with that. We were sent to religious school. We went to synagogue on the High Holidays…But it was much more the idea of the culture of the Jewish people. And that’s how I kind of see our religion now. I want my children to go to religious school, but not because I care whether they speak Hebrew but because I want them to learn about the culture and the history. Ulrich and his granddaughter, Naomi. My mom said from when she can remember him, he always had those knives, peeling those oranges. So where did those come from? And did he always use the same ones? And did he learn that from his dad? …I think knowing his history...asking: What was he like as a kid?...Because everything he did, really was because of who he was growing up, and growing up in Germany. How he worked so hard. And he really was...the American dream. He created this life for himself. And I remember it was one of the few times he ever yelled at me.